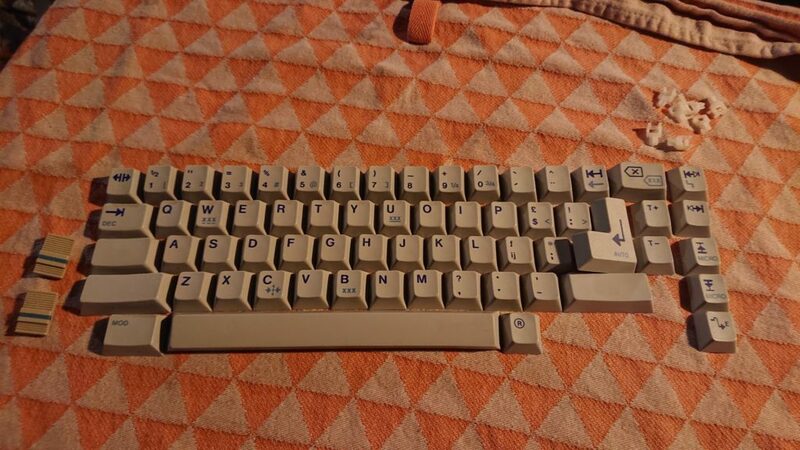 In my last post I assembled a Corne keyboard. At the start of the build I didn’t yet have keycaps to spare for it. How was I able to get good looking keycaps without breaking the bank? I remembered seeing a few posts on the subreddit mechmarket that listed keycaps from typewriters. Sometimes they use the same profile as Cherry switches do. It turns out there is a rather exhaustive list of Triumph-Adler typewriters on the Deskthority wiki, which in turn also lists several sources with Cherry-switch compatible typewriters. 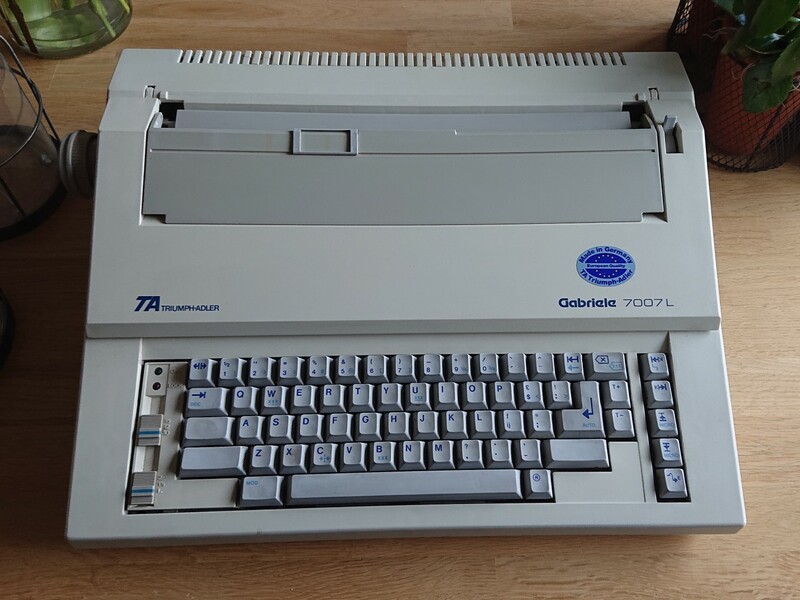 I turned to our local Craigslist-like secondhand site and found a Triumph-Adler Gabriele 7007L electronic typewriter in a very acceptable condition. The caps and the overal typewriter were quite dirty, but it was without any damage, so all it needed was a thorough cleaning. Fill a bowl with lukewarm water and hand sanitizer. Some kinds of soap may be bad for the plastic. I figured hand sanitizer would not be as aggressive as other kinds of soap, so it shouldn’t harm the plastic. If you’re worried: test the cleaning process with a single cap first. Let the caps soak for about an hour. Rinse the keycaps. You can use a strainer to keep the keycaps in place, especially if there’s other parts like stabilizers that might fall into the drain. Clean the keycaps with a soft cloth or with your fingers. You may need to rinse them again. Optionally: If you’re in a hurry, you can use a salad spinner to get most of the water out of the caps. Let the caps airdry, ideally for about 24 hours, though maybe less. Don’t put them in the sun, especially in the summer: it might get too hot and the caps could deform. Done! You can now use the clean keycaps! Drying the caps after cleaning. With about an hour of effort and only €15, I was able to use typewriter keycaps for my new build. The legends might not be appropriate for all keys, but I think they look quite nice. 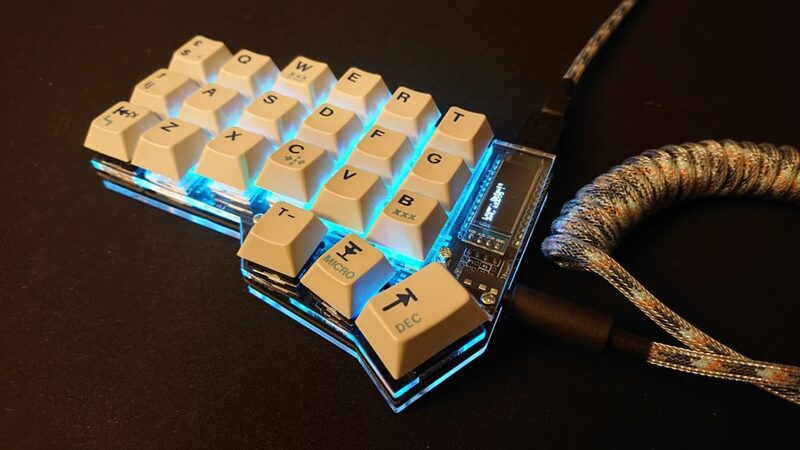 Using the caps on my Corne keyboard.